The inconsistent nature of wind-generated power poses a big challenge to the industry. But wind energy leader Xcel Energy is helping to address the challenge and has successfully completed the first stages of a wind-to-battery demonstration program at a wind farm in Minnesota. Wind energy sometimes gets a bad rap because of its inconsistent nature. The energy it produces doesn't necessarily hit the grid when power demands are high. The solution is simple-store the energy until it is needed. Until recently, the technology didn't exist to accomplish that, but the dawn of the sodium-sulfur battery has now made it possible, and Xcel Energy is putting that technology to use to see how well it works. Xcel Energy is the number one wind provider in the country and views its renewable resources as strategic to its long-term success. "We operate in states with high renewable portfolio standards," explains Frank Novachek, director of Xcel Energy's corporate planning. 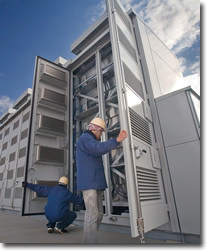 "And we believe that energy storage will play a very important role. Although we can meet the renewable portfolio standards without storage, we believe that to go beyond that will require energy storage." Seeing renewable energy storage in its future, Xcel Energy set out to gain actual experience in that area and find out what benefits it could provide. Xcel decided to run a demo-a one-megawatt, wind-to-battery (W2B) system-to determine if harnessing wind energy and sending it to the grid when needed was possible and economically feasible. 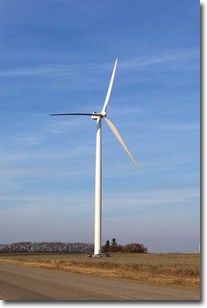 Xcel chose an 11-megawatt wind farm owned by MinWind Energy, LLC, in Luverne, Minnesota, as the location for the cutting-edge demo site. MinWind had partnered with Xcel Energy on an earlier bio-diesel project and had indicated they would be interested in partnering again in the future. "Since their substation is 300 feet away from one of our new transmission switching stations, we could site a battery system adjacent to their wind farm. There was synergy there," says Novachek. The rekindled partnership, along with a $1 million grant from the Renewable Development Fund of Minnesota, moved the project ahead. 1. Evaluate the ability of large-scale battery-storage technology to effectively 'firm' wind energy, enabling a shift of wind-generated energy from off-peak to on-peak availability. 2. Evaluate the ability of battery storage technology to reduce the need to compensate for the variability and limited predictability of wind generation resources. 3. Evaluate the optimal ratio of energy storage to total wind capacity that would allow the wind energy storage system to be a viable peak-load resource. 4. Evaluate whether or not the battery is responsive enough to meet the qualifications of spinning reserve, and evaluate any special relay requirements for a spinning reserve frequency response characteristic. 5. Evaluate the potential for battery storage technology to support the transmission and distribution grid system and therefore allow the system to more effectively integrate wind into system operations. This includes the ability of the battery discharge and recharge process to be used to buffer and/or smooth the wind generation output ramp rates; the optimal mix of battery uses between demand shaping, generator leveling, and contingency reserve response; the ability to provide reactive load support and frequency support. 6. Assess cold weather effects on the performance and integrity of the NaS Battery system. Xcel Energy's Frank Novachek (above) at the company's wind power-to-battery demonstration site in Minnesota. Xcel Energy is the number one wind provider in the country and views its renewable resources as strategic to its long-term success. "We operate in states with high renewable portfolio standards," explains Novachek. "And we believe that energy storage will play a very important role." 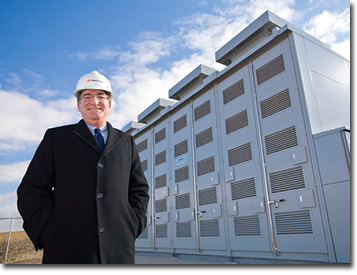 Xcel Energy chose a sodium-sulfur (NaS) battery from Japanese company NGK, a major manufacturer of power related equipment. "At the time, it was about the only battery technology that was out there that had a good commercial track record," says Novachek. "And being a utility and not wanting to put a technology risk on our customers, we decided to go with the tried and true manufacturer." Since Xcel Energy made the decision to go with NGK, many other battery manufacturers have entered the playing field and demonstrated great track records. But despite the lack of choices in 2008, Xcel Energy has had no regrets going with NGK. "The battery has met our expectations and needs," says Novachek. Even though Xcel Energy was making history-with this being the first wind energy battery-storage system in the U.S. using sodium-sulfur (NaS) battery technology-permitting wasn't onerous. "There is quite a bit of study, literature, and actual real life examples on sodium-sulfur batteries in applications that were in far more difficult situations than southwest rural Minnesota," says Novachek. "For example, on Long Island they have a battery almost identical to ours in use, in a densely populated area. "We're not the first ones using this type of battery," adds Novachek. "We're just the first to directly connect it to a U.S. wind farm." Testing got underway in 2009, and part of that testing involved operating the battery as an integral part of the wind farm and shaping the output of the wind farm. "We were also testing the battery's ability to perform under fast response situations and as a bulk storage device, so we can do some time shifting from night to day," says Novachek. Another piece of the test included looking at economic dispatch. "In that particular test, we plug-ged price signals from the Midwest Independent Transmission System Operator (Midwest ISO) into the remote controller of the battery. So when the price signals got to a certain point, we would discharge the batteries to the grid. And when they got below a certain point, we'd start charging the battery to try to take advantage of off peak and peak prices. It worked very well." The batteries performed better than expected. "We've been able to control them under different modes of operation. We've also been able to operate the battery where we sited it in the town of Luverne, though storage doesn't necessarily have to be sited at a wind farm in order to help the grid. Where we sited it allowed us to look at a battery as an asset to a wind farm, or as an asset to the utility grid that might use it more as a shock absorber for the system." Throughout the process, Xcel Energy had to pay attention to certain details, like the fact that MinWind is authorized to put a maximum amount of power out to the grid. Xcel Energy had to ensure the battery never discharged too much at the same time as the wind, going beyond the wind farm's output limit. Now that the first round is complete and the results have come in, Xcel Energy is pleased. The demo has proven that the system performs the functions necessary to help Xcel Energy manage the grid. "I think we were skeptical that the battery would be able to respond as fast as it did," says Novachek. "The round trip efficiency was everything it's advertised. We're seeing right around 75 percent round trip emissions feed, even with the heating losses, since the battery operates at very high temperatures (approximately 300 degrees centigrade)." Now the University of Minnesota has stepped in to conduct other tests that will be finished up in summer 2011. They are looking at a variety of things, including battery performance and a deeper understanding of how sodium-sulfur batteries function. "They are also going to do more analysis on how much storage would be necessary for this particular wind farm to achieve certain performance," says Novachek. "For example, how much storage do you really need in order to reliably control the ramp rate at given ramp limits?" Large-scale battery storage technology has the potential to effectively 'firm' wind energy, enabling a shift of wind-generated energy from off-peak to on-peak availability. Although the test was a success, Xcel Energy probably won't be running out soon and buying a bunch of batteries and hooking them up to wind farms. Novachek says the cost of batteries will definitely need to come down to be economical in large scale applications. When asked if Xcel Energy would do a similar wind-to-battery type test again, Novachek says if they did, they might not site it at a wind farm. "It may be more beneficial for us to place the batteries somewhere else-where it would support the electric grid. There are arguments that it makes sense to have the storage closer to where the load is-that you can store the energy at night when there isn't as much transmission traffic, then during the daytime, you can discharge it downstream to where any transmission restraints might be." In the meantime, Xcel Energy will be testing different technology. "One project we're developing is associated with solar at the Solar Technology Acceleration Center in Colorado," says Novachek. "Our interest is to study the effectiveness of energy storage in managing the variability of solar photovoltaics in high penetrations on our distribution feeders. Whereas the wind-battery project was more of a transmission system application, this would be more of a distribution system application." The NGK wind batteries will continue to store and distribute energy for at least the next 15 years (their lifespan). How they will be used is yet to be determined. Says Novachek, "We haven't decided on what application we're going to operate the battery system in the long run, whether it's for time shifting from night to day or for using it as a resource for providing frequency regulation services for the grid." What Xcel Energy is sure of is that energy storage will be a part of our renewable energy future.